Some puppies get so excited when someone comes through the door that they urinate on the floor. Even a well trained, older dog can exhibit this behavior. 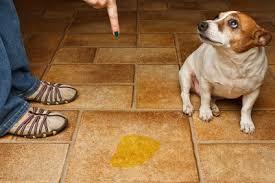 When a puppy gets older and gets a little more confident, accidental urination should go away. The dog owner can re-enforce this behavior by accident. If your dog is having accidents when you walk through the door and medical conditions were ruled out by your veterinarian, never scold your puppy for this behavior and don’t reward him for it either. Hold off on any dog treats until later. If you console the dog after he pees on the floor, you are sending the message that this behavior is OK. Always keep your entrance to the house low key. Ignore the dogs excitement and wait until he is calm before you pet him. When you get to work, turn on some great oldies to get you through the day! Edgewater Gold Radio – Great oldies from the 50s through the 80’s plus pop vocals. Download the free Edgewater Gold Radio app from your app store. Listen on our website: Edgewatergoldradio.com. This entry was posted on Tuesday, September 11th, 2018 at 8:46 am	and is filed under Pet Supplies. You can follow any responses to this entry through the RSS 2.0 feed. Both comments and pings are currently closed.